This is my Tech Edition of gift ideas for the holidays. These are all things that I really find neat and useful. And fun! And let me say, if you haven’t realized it already, that I am very budget-conscious. I don’t recommend or want the highest end things, I recommend the things that are the best bang for a regular person on a budget. UPDATE 12/10/2009: If you read this before, you didn’t see this item. But I had to go back and add it because it is just too good not to include and I had just forgotten to add it in the first place. And what is that item? It is the Gboard: a Keyboard just for Gmail. You may be thinking that sounds like a gimmick, I thought so too. But after reading Mashable’s review of the Gboard and given the super-reasonable price of $19.99, I think this is a great stocking stuffing and useful gadget for people who use gmail regularly. It does all the functions that can be done with keyboard shortcuts in Gmail, but doesn’t require you to memorize all the shortcuts and is easier to use. Mashable says: “Overall we’re impressed with the Gboard. It does what it says it will do, the keys are laid out in a way that makes sense, and, for heavy Gmail users, shortcuts can save a tremendous amount time throughout the day.” For $19.99, if I was a Gmail user or knew someone who was, I’d consider this as a gift. The Droid by Motorola. I have a Verizon cell phone old-style that I got in 2004 and it has been just fine for me. It does everything I want, takes decent pictures and videos, good signal for calling, good battery life, voice calling, etc (no bluetooth but that isn’t a big deal to me). I have never had a desire to upgrade because I never saw a phone that I wanted or that seemed all that exciting. The iPhone never did it for me at all. Too expensive, too proprietary and on AT&T so fugetaboutit. I never really got the iPhone buzz. But then the Droid came out. I’d heard rumblings about the Android operating system that sounded intriguing, but didn’t see the definitive phone that ran it. Until the Droid. My husband just got one for work and he brought it home for me to check out. I haven’t even looked it over to speak of and I’m am starting to want it. I was looking at it and thinking, “OK, it’s nice. Keyboard is still too small for my fat fingers. Not seeing anything special”. Then I stumbled on the Google voice command lookup. I said “papillon” and it brought back a search list. I said “getting wine stains out of carpet” and it brought back instructions. I said “directions to Newcastle Indiana” and it gave me map and step-by-step instructions using GPS. That started getting my attention! I’m really starting to get the itch now. And I can get it for $99 with Verizon 2-year renewal. The only sticking point is that I am hesitant to pay more a month for web/data access. I don’t go out that often to where I would not have my computer or my netbook and paying a fair amt more for the web when I can usually get it for free is hard. And I have a GPS that is free access. I don’t really need it and I have most everything it offers, but I do kind of want one. Next are a few tech tools for easily converting your old negatives, slides and photographs to digital pictures. I know everyone has a stack of photographs laying around that they have taken over the years and would like to scan them in digitally but using a regular scanner, it is quite time-consuming. I wanted something that I could just feed photos into while watching TV or the like. Something easy and not too labor intensive. I did some research and decided on the Pandigital SCN02 PhotoLink One Touch Scanner w/Memory Card fo r a quick, easy and reasonably priced photo copier. I love this and it is definitely on my wish list. It is $85.68 on Amazon. And an item that I have recently purchased is the Innovative Technology 35mm Negative and Slide Converter to PC . I love it and recommend it for a reasonably priced negative and slide converter. I am not going to go into great detail here because I wrote a post on how to use it and showing the results. But I will say that I think it was a very worthwhile purchase and was only $49.99. Another item that I found and want is a pocket projector. If you travel at all, for business or for pleasure, this is sure to please. You can connect the pocket projector to your laptop or netbook and watch TV shows and movies projected on your hotel wall with a picture up to 60″ that is both clear and vibrant. (a good place to watch online is hulu.com or any of the TV station websites). Or give a presentation or slideshow for business without having to lug a huge projector around. Or play your video games in big picture. Or hook it up to your phone (can’t quite see why, but I’m sure there is a good reason). Or collaborate with someone and not have to crowd around the little computer screen. And with the cost of adding luggage to your airfare these days, the less you have to carry, the better. The Optoma EP-PK-101 PICO Pocket Projector- 4 oz. . is somewhat expensive, at $219 but it’s just a clever little thing. It connects to a wide range of things. Note: This product does not connect to notebook computers, PCs, PDAs, cell phones, or other devices unless the device has composite output. Please make sure to consult your device’s owner manual. and it only weighs 4 oz. 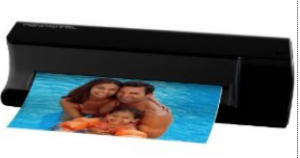 It projects an image size up to 60 inches. 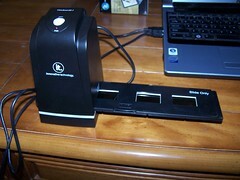 You can recharge the battery via USB or included AC charger. It was listed in the Time’s best travel gadgets of 2009. 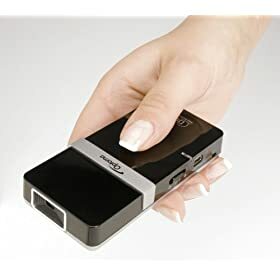 While that sounds decent, I personally would bite the bullet and spend $299 and get the Cinemin Swivel Multimedia Pico Projector which is another pocket projector that looks very good and has all the connectors and everything to connect to a wide variety of devices (without requiring a video composite connection). With this, a netbook and this pocket projector and you are good to go! And it is made by Wow Wee, who have been making the most incredible and innovative toys and gadgets for quite a while. The WowWee Rovio Wi-Fi Enabled Robotic WebCam is available on Amazon for a budget-busting $209. Too much for essentially an adult toy, unless you have that kind of money and don’t know what to get the person who has everything. If you know anyone who does not own a pocket camcorder, they may be interested in one of the various ones on the market. The main ones are the Pure Digital Flip Mino and Ultra, the Creative Labs Vado and the Kodak Zi6 or Zi8. Consumer Search has two full reviews of these: digital camcorders and HD camcorders and you can judge for yourself which one works best for you. You can also see their reviews of each specific one and they are very good. They also include some regular camcorders (not the Flip style) but I would not get one of them, I would go with the pocket camcorder unless there is a compelling reason not to. They are super-easy to use and they plug right into your USB port to upload. All the other camcorders I have owned were difficult to use and especially difficult to upload to your PC. And I was always hunting for the proper cables and it was too much work for me. The pocket camcorders have very limited features (they basically just record and play) and no editing capabilities but you can do all the editing, cropping, splicing, etc. that you would want when you get the video on the PC and it is really how you would want to do your editing anyway. The pocket camcorders are all very similar and in my opinion, just figure out which feature is most important to you (price, HD, etc) and pick the one that matches it best. I got the Kodak Zi6 because it was a good price and most importantly to me, the viewing screen is larger than the others. I don’t see as well as I’d like (getting old, y’know) and that was the deciding factor for me. If you or someone you are buying for already has a pocket camcorder, then they may like some of the accessories for them, like the waterproof case so you can use them underwater. Flip Video AWC2T Underwater Case for UltraHD and Ultra 2nd Generation camcorders (Clear) , Flip Video Underwater Case for 1st Generation Flip Ultra Camcorders , Creative Labs VA0580 Vado and Vado HD Waterproof Pouch (Blue) , Aquapac 404 Mini Underwater Camera Case , these are a few on Amazon. Another way to find them is to just do a google-type search on “underwater camcorder case Kodak Zi6” but replace the Kodak Zi6 with the specific camera case you are looking for. Another thing that I already have, but could not live without, is a GPS with voice instructions. My whole family has them and swears by them. My sister moved temporarily to Orlando and it was a godsend. I have an old Garmin C530 that is the pre-nuvi version (similar to the lowest end nuvi but smaller screen). It works just fine for me. The nuvi versions have a bigger screen, but with the voice instructions, you don’t really need to look at the screen. The most important part is that they have voice instructions and especially that they have text-to-speech. That means they say things like “In 300 feet, turn left on Winchester Road”. They tell you the road name, not just to turn left in 300 feet (and you don’t know for sure which street). An interesting question for some of these gadgets is: How long will it be before they are outmoded because the functionality is included in a all-in-one smart phone. The Droid and other new phones have built-in voice GPS and I believe they may be all you would need (I have to test on my husband’s Droid) and they can also take pictures and record like the pocket camcorders. The quality may not be quite as good, but if all you are doing is uploading them to the internet, which is what a lot of people do, you will barely notice the difference. Especially for the $100 – $300 you would save by not buy a dedicated camcorder. They have pretty much definitively replaced the Palm and other handheld devices. If they had a more functional keyboard, they could replace all kinds of things. There is a rumor about a Tablet PC by Apple in 2010. If it is as expected, it will replace a number of gadgets (how many are unknown at this point). One thing it is supposed to be able to do is act as an e-book reader. If you know me, you will know that I am a very big reader. You might wonder why I didn’t have an e-book reader on my gadgets list. It is mainly because I don’t want to pay the prices they charge to download books and there are very few good free e-books out there and our library does not lend e-books yet. If the prices came down (significantly, or had a cheap subscription plan) or especially, if our library gets e-books, I will reevaluate my decision. At least the e-book readers like the Barnes and Noble Nook and the new Kindle 2 are non-proprietary. It appears they are settling on a standard and that is important. That is a huge downside of the Apple Tablet. Everything they do is extremely proprietary and they don’t open source. That is pretty much why I don’t have much to do with iPhones, etc. One last tech-ish item is the Nintendo Wii . We do not own a Wii or for that matter, any of the latest game systems. We have a Playstation 2 and enjoy it when we have people over (infrequently). We have Dance, Dance, Revolution dance pads and Guitar Hero with guitars. We haven’t had any reason to upgrade though. But the Wii has a lot of things that I have not seen with the other game systems. The other game systems are pretty much limited to gamers and kids. The Wii has afficienados of all ages and interests. My uncle belongs to a Wii bowling league at his independent living apartment complex. A friend’s mom (and their whole family pretty much) use it to exercise. It looks like a lot of fun and very interactive. I like that kind of thing, but most all of the serious games for gaming systems are just too complicated and difficult for me. And now you can get one easily for $199 and with some looking, some places will throw in a $50 gift card. And of course, if someone already has one, there is a plethora of accessories for the Wii . That is the drawback of a wii, the system is reasonable but the games and accoutrements easily cost the price of one apiece. Rather than list them all, wii and accessories will show you a list from amazon. The Wii MotionPlus accessory for Nintendo Wii ($20, or $50 with a game, available at bestbuy.com and elsewhere) is an attachment for the original “Wiimote” controller. The MotionPlus makes the motion-sensing controls more sensitive and precise, so a flick of a wrist can turn your virtual tennis racket and spin your bowling ball. If your gift recipient doesn’t already own “Wii Sports Resort,” it’s worth throwing that in, too — it adds frisbee-throwing with a dog, water-scooter racing, sword fighting and other new games and comes with one MotionPlus attachment. Here is a writeup that includes this and more tech gift ideas for $100 or less. Anyone who has a wii would probably really appreciate a game or accessory for it since there are so many things it can do. And they come in all price ranges. Well, that is it for my budget friendly tech toys and gadgets for 2009. I’m sure the people on your list would love at least one of these items and you probably may too. Tagged budget, gadgets, gear, gifts, ideas, presents, shopping, tech, technical, toys. Bookmark the permalink.